A late 2nd to mid 1st century BC gold quarter stater of Early Uninscribed QC type, ABC512 'Bognor Cogwheel' type, but with no mane on the horse. BMC 503-508. 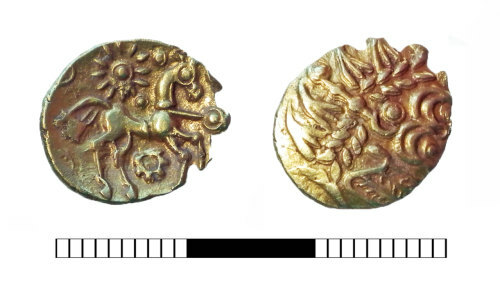 An Iron Age gold quarter stater of 'Bognor Cogwheel' type, ABC 512 / BMC 503, c.65-45BC.